Ty Hyderally is the Owner of Hyderally & Associates, P.C. located in Montclair, New Jersey and New York, New York. He has been included in the list of Top Ten Leaders of Employment Law in Northern New Jersey1 and concentrates on Employment Law. Ty Hyderally is the Owner of Hyderally & Associates, P.C. located in Montclair, New Jersey and New York, New York. He has been included in the list of Top Ten Leaders of Employment Law in Northern New Jersey1 and concentrates on Employment Law. In August 2006, Mr. Hyderally was selected to the Super Lawyer in New Jersey list as a Rising Star.2 The Firm takes pride in aggressively and efficiently litigating to protect the rights of their clients whether the party on the other side is a small company or a mega corporation of over 10,000 employees. This firm follows two mantras: ferocity and velocity. Additionally, Mr. Hyderally has conducted arbitrations before the American Arbitration Association the New York Stock Exchange, and the National Association of Securities Dealers, Inc.; has litigated in California, Texas, and Arizona; has served as a Judge in National Employment Moot Court competitions; and litigated national employment class actions. Mr. Hyderally is admitted before the New Jersey State and Federal Courts, the New York Federal Courts (Southern and Eastern District), the United States Supreme Court, the US Court of Federal Claims and the Court of Appeals for the Armed Forces. He is a former President of the National Employment Law Association (New Jersey) from 2008-2012. He currently serves as the Chairperson of the New Jersey Employment Law Seminar. Furthermore, he is a member of the New Jersey Bar Association (Employment Section) and the American Bar Association (Labor and Employment Section). In May 2005, Mr. Hyderally was nominated to serve as the Co-Chairperson of the Trial Litigation Sub-committee of the American Bar Association's Labor and Employment Litigation Section. This nomination is a significant honor, as the Trial Litigation Sub-committee is considered one of the most significant sub-committees of the Employment Litigation Section. This nomination demonstrates Mr. Hyderally's commitment to trial litigation and reflects how he is viewed by other seasoned national litigators who nominated him to this position of Co-Chairperson. 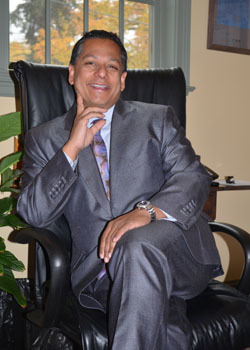 Mr. Ty Hyderally has served as a featured speaker at national and New Jersey seminars to attorneys, human resources professionals and corporate officers on such subjects as employment law, sexual harassment, workplace torts, the Americans with Disabilities Act, and the Family Medical Leave Act. He has published employment opinions before the New Jersey Supreme Court on the issue of Sexual Harassment (LAD) and Whistleblower (CEPA). Mr. Hyderally's prior employment history includes working as a Criminal Trial Lawyer in the Judge Advocate General's Office of the US Navy, working in a boutique employment litigation firm in Pensacola, FL that specialized in federal court litigation, and working as an employment litigator on the plaintiff's side at Davis, Saperstein & Salomon, PC and Kievit, Kelly & Odom and on the defense side at Friedman & Siegelbaum, LLP, Roseland, NJ and Jackson, Lewis, Shnitzler & Krupman, Morristown, NJ. Mr. Ty Hyderally received his JD from the University of California (Boalt Hall), Berkeley, CA and his B.A. with Departmental Honors from Johns Hopkins University, Baltimore, MD. We welcome you learning more about the firm by contacting it directly at (973) 509-8500 or via email at tyh@employmentlit.com. The main office of the firm is located at 33 Plymouth Street, Suite 202, Montclair, New Jersey 07042. The fax number for the firm is (973) 509-8501. 1 The Ten Leaders list is issued by the Ten Leaders Cooperative. A description of the selected methodology can be found at http://www.tenleaders.com/research.php. No aspect of this advertisement has been approved by the Supreme Court of New Jersey.